Security concerns and productivity loss are the top reasons businesses restrict access to social tools, according to a new study commissioned by Microsoft. However, while many executives aren't yet on the social bandwagon, 40 percent of employees believe that there isn't enough collaboration in the workplace and that these social tools help foster better teamwork. Brian Murray, director of enterprise strategy at Microsoft, says that this disconnect has led employees to bring their own technology into the workplace in order to address a changing business environment. "Freemium products let employees try new tools in small groups before the IT department even knows about them," Murray says. Employees are using these tools to communicate with colleagues; share and review documents; communicate with customers and clients; and grow their professional network, according to the report. "Work is becoming more global and less routine," Murray says. "People are more dispersed than ever and there's a stronger need to stay connected regardless of location. The workplace is changing, and that's causing tension." According to the report, in which research firm Ipsos surveyed nearly 10,000 information workers in 32 countries, 34 percent of respondents say their company underestimates the benefits of social technology, and 37 percent say they could perform their jobs better if management backed the use of social tools. But while employees are enthusiastic about using social tools, IT departments and leaders are still wary: Gartner estimates that 80 percent of enterprise social networks will fail to deliver business value. Where most businesses fail, according to Adam Pisoni, Microsoft's general manager of Yammer, is with developing a social strategy. "You can't just turn it on and expect a cultural transformation," Pisoni says. "It's a journey of reinvention that requires a strategy and executive commitment and support." To be successful, Pisoni says, you need to weave social into the apps employees use every day. Assess the current situation and define a vision. How does the business work day-to-day and how can these processes be improved? Gain executive sponsorship. For an enterprise social network deployment to be successful, executives need to approve of and support the mission. Identify groups or teams that can move their day-to-day work onto the social platform and realize quick benefits. Define clear ways to measure success. 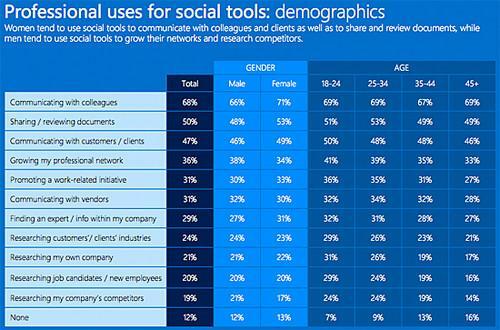 For a look at Microsoft's infograph detailing these findings and more, click here.